Prior to the invention of photography and photomechanical halftones, the printing of pictures required the handwork of skilled artists. For centuries, craftsmen used various manual techniques—engraving, etching, stippling and drawing—to create original images on wood blocks, metal plates or lithographic stones that could be inked and printed onto paper. At each evolutionary stage—from relief to intaglio to lithography—pictorial printing became incrementally more productive. However, the craftsmen’s work persisted and the process remained slow. Well into the 1800s, it was common for creative work on pictures such as engraved images on text pages or separately printed lithographic plates to begin a year or two before the date of publication. Although the artistic work was time-consuming, it often produced striking results. By the time color printing methods were perfected, magnificent pictures began to appear. In the mid-nineteenth century, pictorial color printers—some using RBY or RBYK models and others using “tinting” techniques of up to 20 or even 30 different colors—were producing astonishingly beautiful prints. As the methods advanced and cost per picture declined, the quantity of color printing grew. This expansion was in part due to the industrialization of printing press machinery. The speed and volume of print was being driven up exponentially by metal cylinders, steam power and rotary printing equipment. “Her Most Gracious Majesty Receiving the Sacrament at her Coronation” (1841) is among George Baxter’s most famous pictorial work. It includes two hundred identifiable portraits of individuals who were present at the event. Another side of the surge in color was that more people than ever before had access to the new low-priced prints. For the first time, average people could buy printed copies of paintings and other items previously seen only in the private collections of society’s elite. The color printer became for the people the disseminator of artistic masterpieces and the chronicler of contemporary events. A few enterprising printers recognized that industrial society had created an opportunity to produce and sell pictures to the general public. They established companies in cities and employed the available labor—including child workers—to print inexpensive color pictures for the growing urban population. In this environment, the Englishman George Baxter emerged as perhaps the most important figure of the era of pictorial color printing. In some respects, the color work of George Baxter should be considered Victorian-age fine art. Even though he produced upwards of 20 million prints during his lifetime, Baxter’s work exhibits virtuosity in the technical aspects of platemaking and printing as well as extraordinary gifts as an engraver. Baxter’s novelty was that the first impression was printed in black or gray ink with an intaglio outline or “key plate” and then subsequent multiple layers of color tinting were printed with relief woodblocks. His convergence of intaglio and relief printing produced pictures that were significantly superior to anything printed with either process independently of one another. Prior to Baxter, key plates had been used in the more labor-intensive process of color tinting by hand. In the case of the woodblock method (also known as chromoxylography), it was used previously by others without the preliminary step of the key plate. It is also true that a combination of the two methods had been performed a century earlier by the Englishman Elisha Kirkall, but with nothing approaching the level of Baxter’s perfection or economy. A decisive aspect of what became known as Baxter’s Process was the remarkably consistent quality of the entire color printing run. This was achieved with tight registration—using four pins or “pointers” in the press to hold the paper in position from one impression to the next—and oil-based inks. The advent of improved brightness of pigments and the permanent quality of the oil-based inks gave Baxter’s prints a superior color fidelity. 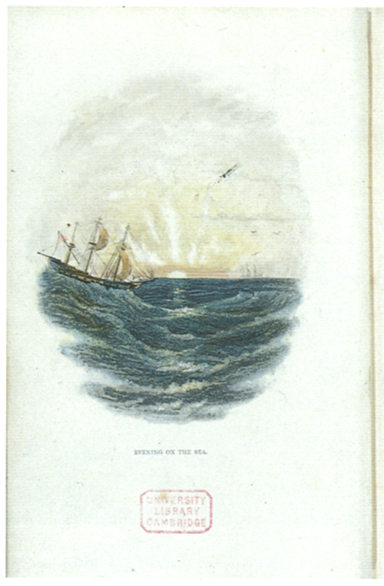 Among the first examples of Baxter’s method was the frontispiece of Robert Mudie’s 1835 book The Sea. What may seem today as a subtle change, the picture of a boat at sea during sunset carries a degree of precision and detail that was not achievable prior to Baxter’s two-step process. George Baxter was born on July 31, 1804 at Lewes in the southeastern English county of Sussex. This area is known to have been a center of the early English printing and papermaking industries. George was the second son of John Baxter, the proprietor of a typography, printing and publishing establishment in Lewes. George’s father would gain in his lifetime a reputation as an advanced printer who was the first to test and perfect several early industrial innovations in printing press technology. George attended Cliffe House Academy and went to high school at St. Ann’s in Lewes. After he finished school, he worked in a book shop in Brighton, a seaside town less than ten miles from home. Later, although the record is unclear, he apprenticed as a wood engraver and lithographer. At age 23, George migrated to London and set up his own business as an engraver and printer. 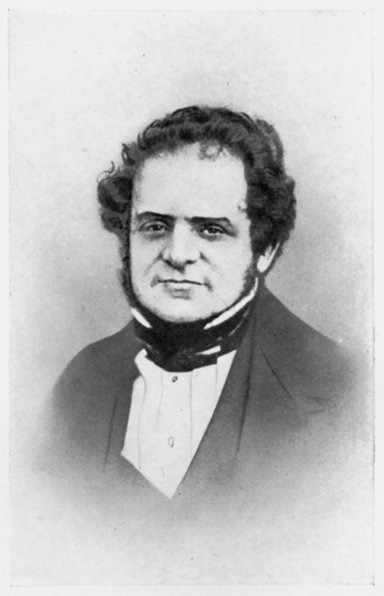 Six months after starting his enterprise in London, George married Mary Harrild, daughter of Robert Harrild, a printing industry innovator and business partner of John Baxter. The record shows that at this time George Baxter began his experiments with color printing. 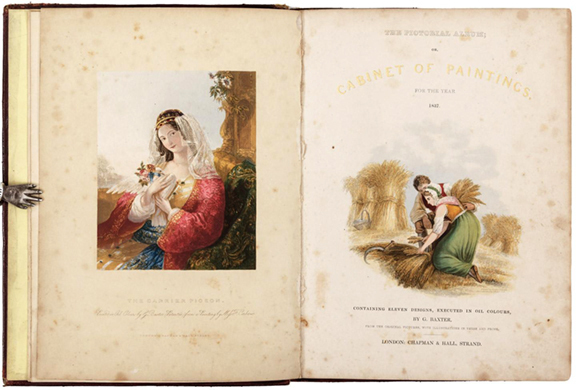 “The Pictorial Album, or Cabinet of Paintings for the Year 1837” included eleven color prints by George Baxter. Some consider this to be among his finest work. At the end of 1836, Baxter produced a volume called The Pictorial Album, or Cabinet of Paintings that was published by Chapman and Hall. This project—which contained ten pictures including reproductions of several works of well-known artists of the day along with a frontispiece—was the first major publication of Baxter’s process. Some have said it was the high-water mark of his craft. 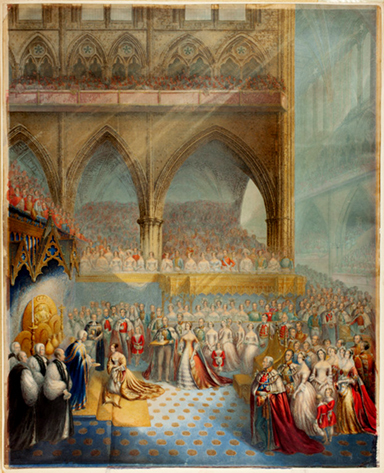 In 1841, Baxter printed two pictures called “Her Most Gracious Majesty Receiving the Sacrament at Her Coronation” and “The Arrival Her Most Gracious Majesty Queen Victoria at the House of Lords to Open her First Parliament” that include 200 portraits of identifiable guests at the event at Westminster Abbey in 1938. These oil-color prints—which are 21-3/4” by 17-1/2”—were prepared in cooperation with Buckingham Palace and gained Baxter direct access to the Queen and other royals in Britain and elsewhere in Europe. Confident of the superiority of his methods, George Baxter was not shy about self-promotion as he gained a level of notoriety for his invention. However, as Baxter was continually preoccupied with the artistic and technical aspects of his business, he was never successful financially. In 1849, he petitioned the Privy Council and was granted a five-year extension on his patent on the grounds that he had lost money during the previous fourteen years. Baxter also exhibited prints at the international expos in New York City in 1852 and Paris in 1855. He was awarded medals for these entries. Later, Baxter produced a series of prints called “Gems of The Great Exhibition” which show the grandeur of his vision and the dexterity of his engraving skills. Baxter’s series “Gems of the Great Exhibition” (1852) included this image of the exterior of the Crystal Palace in London. 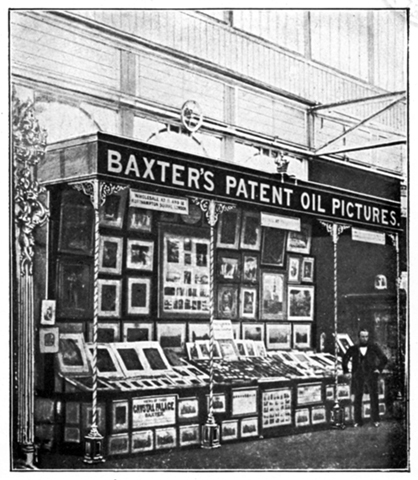 In later years, while still holding his patent, Baxter took to licensing his method to other printers as a means of generating income. Having obtained color printing patents in France, Belgium and Germany as well as Britain, Baxter sold annual licenses to a handful of printers in all of these countries. Some have said that the work of these printers never approached Baxter’s in graceful detail and delicate coloring. Six years after his process went into the public domain, Baxter liquidated his oil-color printing business and sold off his inventory of prints and intaglio plates and woodblocks to another printer. Part of this arrangement included Baxter’s agreement to provide technical assistance to the new owner. The reasons for his decision to exit the business are unknown. It is clear that by the 1860s other competing methods such as chromolithography (Engelmann, 1837) and photography (Daguerre, 1839) were challenging the Baxter method in both quality and cost. By 1865, the remainder of Baxter’s printing business went bankrupt. However, George Baxter is remembered for the lasting impact of his original color printing method and for making color printing popular and viable. Like others before and after him, Baxter’s genius and creative gifts intersected with important changes in the means and methods of printing during his lifetime. It is undeniable that George Baxter played a decisive role in expanding the influence of print upon society during the Victorian era.